[181 Pages Report] The non-woven fabrics market size is estimated to grow from USD 22.62 Billion in 2016 to USD 34.85 Billion by 2022. The market is projected to grow at a CAGR of 7.51% during the forecast period. The base year considered for the study is 2016, and the market size is projected from 2017 to 2022. The report aims at estimating the market size and future growth potential of the non-woven fabrics market across different segments material, technology, function, application, and region. The other objectives include providing detailed information regarding the main factors influencing the growth of the market (drivers, restraints, opportunities, and industry-specific challenges). It also aims to study the individual growth trends, prospects, and contribution of the various segments to the total market. The study also analyzes opportunities in the market for stakeholders and details of the competitive landscape for the market leaders. It strategically profiles key players and comprehensively analyzes their core competencies. The market ecosystem includes various stakeholders involved in the supply chain of the non-woven fabrics industry starting from raw material suppliers, research & development, and manufacturing. Post this, the marketing and sale of products take place, which is only possible if an efficient distribution channel is developed. Finally, the end products are made available to consumers. The global market for non-woven fabrics market is dominated by players such as DuPont (US), Kimberly-Clarke (US), Berry Global Group (US), Ahlstrom-Munksjö (Sweden), Freudenberg (Germany), Glatfelter (US), Suominen Corporation (Finland), Johns Manville (US), Fitesa (Brazil), and TWE Group (Germany). 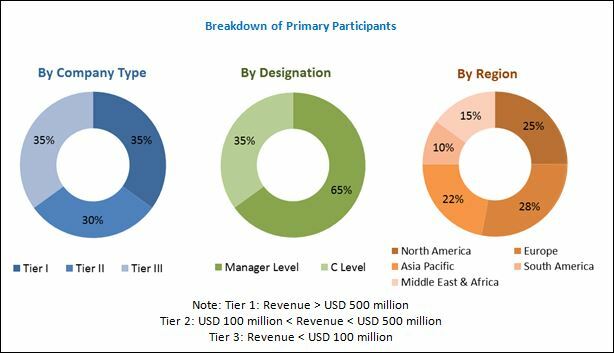 MarketsandMarkets projects that the non-woven fabrics market size is projected to grow from USD 24.26 Billion in 2017 to USD 34.85 Billion by 2022, at a CAGR of 7.51%. 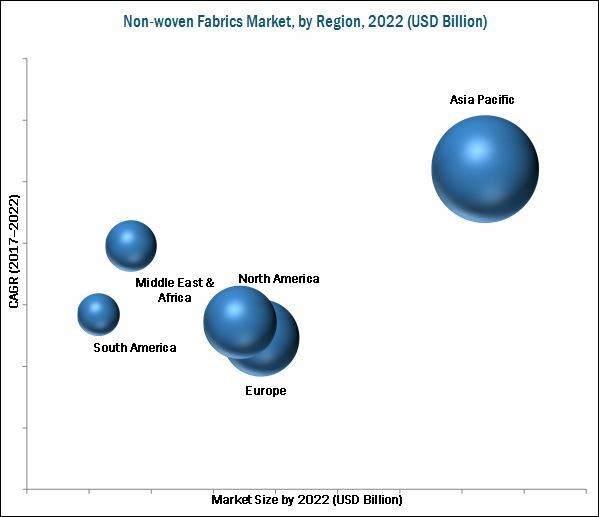 The non-woven fabrics market is witnessing considerable growth due to the growth of modern healthcare in developing markets and rise in awareness of environmentally friendly fabrics. This market has immense opportunities due to increase in the importance of geotextiles and proliferation of new technologies. In addition, regulatory frameworks are promoting the usage of non-woven fabrics. Factors such as volatility in the price of raw materials and complexity of the supply chain are the major challenges faced by the non-woven fabric market. On the basis of technology, non-woven fabrics considered for the study include spunmelt, dry-laid, wet-laid, and others which include binder resins, additives, and other polymers & fibers. Spunmelt technology is the most widely used for non-woven fabrics. However, the dry-laid segment is projected to grow at the highest CAGR from 2017 to 2022. Dry-laid non-woven fabrics find wide application in wipes, personal care, and packaging markets. The growth in these industries can be attributed to the rise in disposable income levels and rapid urbanization will drive the dry-laid non-woven fabrics market. The non-woven fabrics market, by application is segmented into hygiene, wipes, construction, upholstery, filtration, automotive, and others (medical, geotextiles, agriculture & landscape, industrial/military, office & stationery, leisure, and shoes & leather). Baby diapers, sanitary napkins, adult incontinence products, training pants, and lens tissues are the key application areas of non-woven fabrics in the hygiene segment. Non-woven fabrics are affordable alternatives to traditional fabrics as they can be disposed of after each use. Hence, there is a high demand for these fabrics in the hygiene segment. In 2016, the Asia Pacific region accounted for largest share of the global non-woven fabrics market. Countries covered in this region include China, India, Japan, Australia, Korea, along with the Rest of Asia Pacific region. China is estimated to be the key market in the region, followed by Japan, India, Korea, and Australia. Asia Pacific is projected to be the fastest-growing in the non-woven fabrics market, in terms of value and volume, followed by the Middle East & Africa, North America, and Europe. Higher domestic demand, along with the availability of low-cost labor, makes this region the most attractive market with non-woven fabric producers. Players are focusing on this region to gain a larger market share and increase profitability. According to the Population Reference Bureau, China, India, and other emerging Asia Pacific countries collectively exceeded a population of 4 billion in 2015, which is expected to become an increasingly important driver for global consumption over the next two decades. The high production cost of non-woven fabrics is one of the major restraints that limit the growth of the market. The global non-woven fabrics market is dominated by players such DuPont (US), Kimberly- Clarke (US), Berry Global Group (US), Ahlstrom-Munksjö (Sweden) Freudenberg (Germany), Suominen (Finland), Johns Manville (US), Fitesa (US), and TWE Group (Germany). Other players include Toray Industries (Japan), Avgol industries (Israel), Asahi Kasei (Japan), Fiberweb (India), Umzamo Nonwovens (South Africa), Sunshine Nonwoven Fabric (China), Autotech Nonwovens (India), Hollingsworth & Vose (US), Milliken & Company (US), Pegas Nonwovens (Luxembourg), Fibertex Nonwovens (Denmark), Cygnus Group (India), HydroWEB (Germany), US Felt Company (US), and Bayteks Tekstil (Turkey). These players adopted various strategies such as new product launches, expansions & investments, joint ventures, and mergers & acquisitions to increase their share in the non-woven fabrics market. 13.11.7 Autotech Nonwovens Pvt Ltd.
13.11.14 Bayteks Tekstil San. Ve Tic. A.